Liisa Sömersalu is a young scientist from Estonia. She is a PhD student at Södertörn University in Stockholm where she is doing a research on Estonian citizen movements. I am curious to know more about this topic and about the change itself. That’s why I invited Liisa to make this interview. And decided to share it with you. It’s inspiring! Please give me nice examples of Estonian ecological and human rights / other movements? 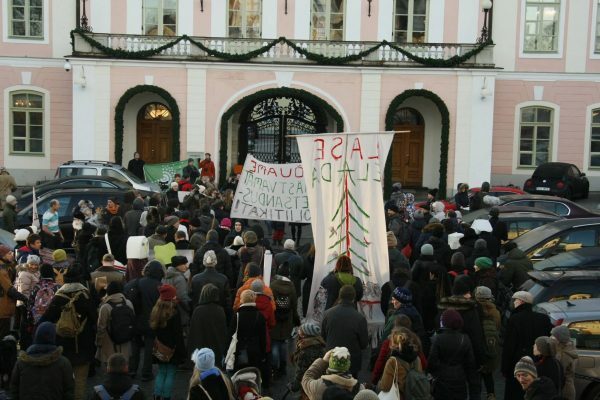 This year has been an active year for Estonian citizen movements with several protest and other events happening. Three main movements that got a lot of media attention were a forest movement (Eesti Metsa Abiks – Helping Estonia’s Forests); movement ‘Avalikult Rail Baticust’ (Publicly about Rail Baltic – a huge railway project that should go through the three Baltic states) and movement for animal rights that advocated the banning of fur farms and circuses with wild animals as well as an emerging of a new organization called Nähtamatud Loomad (Invisible animals) that campaigns for humane treatment of farm animals. One extraordinary case was a month-long sit-in protest where people were camping around a willow tree to prevent it to be cut down. The tree was cut down in the end but it became sort of a symbol of poor communication between the state and the citizens. A feminist blog and Facebook group has also influenced public discussions lately but I am not sure if I could call that a movement. Above examples are those that are actual now. There are different movements that usually start as a reaction to a specific problem and then cool down to reactivate later if needed. For example, we had a protest movement against the construction of one big road in Tallinn, a movement ‘Friendly Estonia’ to show a humane side of Estonia in the refugee crisis, and an initiative to promote a law about gender neutral civil partnership. The latter has become an issue again with local elections when the conservative party made a proposal to cancel the law. What tools they use to promote their causes? It depends on their resources and on the cause. Controversial issues have more difficult time to promote their causes than something we all can agree on (like picking trash). The biggest challenge for the activists is to get their causes covered by mass media. At the same time, it is crucial to do so since it is still there where the public opinions are formed. With some more difficult issues, there are propaganda wars held in the mainstream media where businessmen and politicians say one thing and civil society actors something else. Main tool for promoting causes seems to be social media and mostly Facebook. However, getting a coverage on mass media boosts the visibility significantly. Since Estonia is very small, compared to Bulgaria it is probably easier to get in contact with journalists through personal contacts or sometimes are issues even picked up from activists’ social media pages by journalists themselves. The big question for movements and civil society organizations is how to reach the undecided majority since on Facebook you mostly communicate to people who already agree with you. To reach the wider public you need to use all the channels possible and Internet might not be enough. And where in the mix is the place of Internet? Internet has a central role in most of the communication in the contemporary society: it incorporates the main functions like for example sending e-mails, calling (+instant messaging), finding and sharing information and communicating with state institutions. And of course we have social media, which works well for both internal and external communication for civil society actors. These days, it seems that one needs to argue that face-to-face communication is still very important and Internet is not replacing the contact in real life. According to my interview persons, Facebook is the main social media channel they use for their organizations and causes. It takes quite a lot of effort to keep those pages running and everybody has their own strategies to keep them updated and moderated (if necessary). Regardless, it is an important tool. According to one of the forest activists, their Facebook group keeps their movement alive. She made a Facebook account just for the occasion at the same time disliking the platform strongly. Very often Estonia is given as an example for digitalisation – do you think this helps the civil society and the movements? Yes and no. My interviewees found that the most useful function is to sign documents digitally and that online services provided by the state ease the bureaucracy. More complicated systems were not considered very user friendly for NGOs (court systems for example). Most of the services are however directed towards businesses and towards communication with state institutions and not so much for developing e-democracy (except for e-voting and all parliament discussions being available online). There were few tools where people could propose law changes but them being top-down initiatives, they have not lasted. Now we have a new platform developed in co-operation with civil society and time will tell if it will work. More information here: https://rahvaalgatus.ee/about. As an Estonian, it is also a bit difficult to evaluate how digitalization has affected civil society since using digital services has become something very natural for us. Mapping Digital Media project reports that Estonians are active in using digital services for making their everyday life more convenient but willingness to take part in online public discussions is still low. For such a change, there should be change in the values and that takes a bit longer time. The report states also that using Facebook for single issues is becoming more common. Indeed, there are several causes that have started as an initiative on Facebook and turned into something bigger (the forest movement being one of the latest examples). I have noticed another positive occurrence which is Internet based social entrepreneurship. One example is CitizenOS, a platform for participatory decisions for teams and communities. Aforementioned Rahvaalgatus petition site is also built on that. I will add few more links below. What else interesting from your research you would like to share with the Bulgarians, working on our civil society? One interesting thing that has come up is the question of emotionality. On one side, it is about language use: how one organization or movement should communicate their message to the wider public. Formal organizations have less freedoms in how they talk about issues at the same time needing to find a way to engage public in their campaigns. Informal groups have more freedom to speak their mind and point fingers but only up to a point so that they would still be considered legitimate. The lastly mentioned is especially true for environmental actors. There is a paradox apparent: environmental issues are deeply emotional and oftentimes some drastic expressions are needed to attract the attention and raise awareness about the problem. At the same time, such emotionality is dismissed by politicians and sometimes by wider public when they ridicule environmentalists as tree-huggers and hippies. There needs to be a good balance: being feisty and demanding change but at the same time base those demands on hard facts, scientific studies and visual proof. The second thing that attracted my interest was the personal struggles and strategies of using social media and Facebook. On one side, in some cases the function of the Facebook changes: using it as a tool activist work the borderlines between the private and public are becoming blurrier. Some of my interview persons said that they have stopped or reduced posting personal things on their Facebook timeline. Those working in the formal organizations had a better control over separating work and personal use (for example by not posting work related issues on their walls) whereas informal groups and single activists used their personal network more for their causes. On the other hand, the way Facebook and social media in general is built up creates problems on its own. There is a constant flow of information which is hard to systematize and things happen very fast. Being a responsible for a Facebook group or page can be quite stressful as one feels the responsibility to check it all the time: either not to miss some information or having to write posts and answer messages to preserve the good rating of the page, at the same time keeping discussions civil and troll free. This raises a question if the effort that goes in the up keeping of social media profiles gives a corresponding positive effect for the organization/movement or just takes away resources from other more important matters? Finally, I would like to suggest Bulgarian activists and civil society actors be mindful about their digital media use and avoid burnout. Social media and Internet are great tools for civil society but only if one uses them wisely. Helpific – connects people with special needs who need help with everyday activities to people who want to help them. I find it very worthy initiative. Garage 48 – startup hackathon. Often have social themes like circular economy. And the above platform was created there.